Touching a wild horse eluded me, but the encounter inspired a logo. When I met Dianne Benson of CircleQuest, I was up for exploring first-hand her exotic, equine-based self-discovery programs. Sometimes the best way to understand a client’s product or service while designing their brand is to experience it for myself. Direct experience gives me information such as colors, shapes, tastes and textures that go beyond any words or reference they might supply. I’ve sampled wine, steeped myself in music, and offered up my wrist’s pulse points to create a client’s wine labels, CD artwork, or character-based logo. My process works best when I understand from the inside-out what my clients are all about. Little did I know my encounter with a wild horse would unleash deep emotions, transform my perceptions, and inspire me—all for a logo! I’d flown to Solvang, California to spend a day following Ms. Benson around. She’s a striking, energetic person whom I took to immediately. Ms. Benson has a performer’s body, lithe with powerful arms, capable hands, and the lean hips of one who rarely sits still. On this warm January day, she was dressed for ranch work in a short-sleeved indigo t-shirt, blue jeans, and weathered cowboy boots, which she kicked off as we transitioned between animal and human realms. Early scribbles for the logo included spirals, the letter Q, Zuni medicine arrow, and the figure-eight loop of infinity. In her home office, my client showed me photos, documents, and plans to explain CircleQuest. I knew her business had something to do with horses, so I scribbled notes and kept my mind open as to where our adventure might lead. Perhaps riding? Some sort of game or meditation involving horses? While recounting her days as an expedition leader and tutor of learning-challenged kids, Ms. Benson often leapt from her chair to mime climbing mountains, exploring the earth, and her latest specialty: wrangling horses. Her shoulder-length blonde hair flew and her eyes flashed with enthusiasm as she spoke. I couldn’t help noticing that Ms. Benson seems a kindred spirit to the equines at the heart of her work. Before long, we were off to the stables where she would give “raw” horses a taste of human doings. I planned to document the process with my camera and hopefully find tangible inspiration for the CircleQuest logo – and a better understanding of her business. Ms. Benson is the first horse-whisperer I’ve witnessed at work. Trained by Monty Roberts, she is expert at “joining up” with wild horses, a technique whereby a handler bonds with an unbroken horse through body language. The day of my visit, her subjects were three Gypsy Vanners, a breed of small draft horses with feathered feet, plush coats, and the romantically long manes and tails of little girls’ dreams. The ranch where the horses were stabled was in foreclosure, so Ms. Benson had to work fast to prepare the horses for handling and sale. In a large pen, Ms. Benson silently closed in on the first horse and then backed off, alternating pressure with release in a dance designed to build confidence. She flicked a whip in the air to inure the young horse to distractions, then coaxed its head into a halter. The horse’s ears swiveled this way and that, its eyes rolled white at the edges, and it dug in its feet with stubborn fear. Led on the halter, the horse stumbled along, trembling then halting, ambivalent. At any moment I sensed it might rear, buck, or bolt. Clucking and murmuring in the equine equivalent of baby-talk, Ms. Benson coaxed the horse to a stall where she tied both sides of its head in “cross-tie” ropes that limit side-to-side motion—a first for this horse. After some soothing, she sprayed it with water, gently to start and then more heavily as the horse relaxed into its first bath. The return to its pen involved more tripping and sudden shying away from everything strange. At that moment, how people ever master a horse to ride in dressage competitions, jump over fences and water crossings, or uproot a stump from the forest, struck me as nothing short of a miracle. Dianne Benson works with an unbroken Gypsy Vanner using body language (left) and reassurance to familiarize the horse with basics like being in cross-ties and getting a bath (right). Note the awkward, stumbling feet (left) and the rolling eyes (right), signs that the horse is still raw. With one horse tempered, my client moved on to the next: a lovely, gentle pony who needed to be taught to lift each foot on command in preparation for shoes and the farrier. I felt inexplicably fond of this horse and concentrated on pictures. Soon, Ms. Benson asked if I would like to experience one of her charges. I put away my camera and next thing I knew was alone in the pen with a wild horse—not the one I liked so well, but a wary, more skittish creature. My assignment was to touch the horse’s neck. Simple enough, I thought. I’m ready! Why not?! 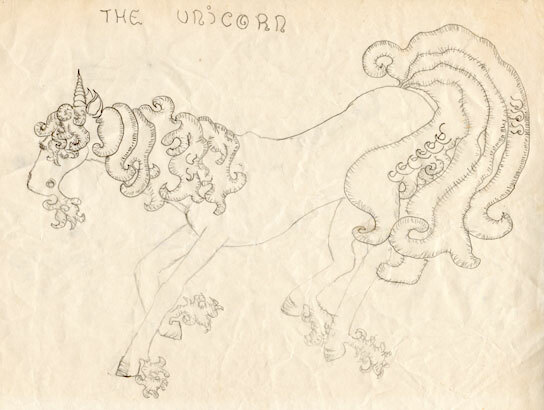 A fanciful unicorn I drew the summer I was ten. Or so I thought. The horse has always struck me as magical. My very first love affair was with a palomino named Bonanza. I was ten. I used to go crazy when I smelled him—or any horse for that matter. I fantasized for hours about riding off to the heavens together, like Pegasus. Today, over four decades later, I still have some hair from Bonanza’s mane and a snapshot of him greeting me at the fence. In the meantime, two of my three sisters are masterful horsewomen, as is my dear friend who introduced me to Ms. Benson. All this is to say I’ve been around horses. Somewhat. I’ve (accidentally!) galloped on a Percheron—an enormous draft horse that weighs just under a ton—had my fingers nipped at by a Shetland, been stepped on by a quarter horse, and was once kicked (lightly, in warning) by a chestnut. In short, I am a lifelong “horse amateur” who dreams of magical rides and knows enough to be wary with strangers. Yet was that enough to face an unbroken horse alone? An abstract logo concept incorporates the letter Q, the infinity loop, and the curving lines of a lassoo. This design was the client's second choice. Ms. Benson, just outside the pen, watched but said nothing. What to do? I typically let a strange dog or cat sniff my hand to get used to my scent. That’s what I’ll do with the Gypsy Vanner, I thought. Once she knows my smell, I should easily put my hand on her neck. Still, this was a wild horse! Fear, excitement, and challenge coursed through my heart as I extended my hand toward her. The horse sniffed my fingers. I felt the slight warmth of her breath for a split second. Then she drew back warily, clumsy with fear. I was so excited I froze. Too late, I turned away. The pressure of my attention overwhelmed her. To escape, the Gypsy horse ran past my grasp, to the far side of the pen. After several more attempts, it was clear I would fail to touch her. She tossed her head and eyed me from far away. At this point, Ms. Benson changed places with me and started to work with the horse. As I left the pen, my eyes stung with sadness and frustration that was abrupt as it was profound. The wild horse, being so near and yet untouchable, unleashed deep turbulence in my heart. An unexpected and intense grief came over me, like the unshakable feeling that comes when you wake from a particularly vivid dream. All at once there welled up in me every unfinished project, failed effort, and lost opportunity of my life. My unfulfilled hopes and visions became the wild Gypsy horse: elusive, free, and untamable as Nature’s great mystery that lies beyond human reach. Rough color comps for the final CircleQuest logo design. Subtle details include whether the horse is inside the letter Q or outside leaping in, how to express elusiveness, and how to convey the idea of adventure in the background treatment. After a while, Ms. Benson sat down beside me on a haystack as I wept. “Why do you think I put you in with that particular horse, and not the one you liked?” she prodded, a little rhetorically. I knew the answer. The other, gentler horse would have let me touch her, and then…Then, I would have missed the chance to encounter my own limits, the edges of my confidence, the very place where growth and transformation was possible. I suddenly understood what CircleQuest was: a chance to confront one’s own fears, the inner thoughts that block a person from reaching for—and achieving—their wildest dream. In my case, an illusory sense of caution and despair, based on a false perspective of past “failures,” had been holding me back unconsciously. I had to ride that wild horse, to befriend it, to keep it close to me. I suddenly saw my past “failures” simply as efforts I’d not quite finished. Not yet. But certainly no longer as failures. I gave Ms. Benson a grateful hug, flew home and went straight to work. The final logo design. The different colors give the client options for branding various aspects of her business. It was wonderful to read about your incredible learning experience at the farm. You captured so many of the basic horse training techniques, body language, communication and touch. I really enjoyed that you included the Unicorn drawing from when you were ten. It’s like a seed to the plant that has sprung from all your creative talent; it foreshadows the development of your artistic talent through process, exploration and experimentation. The drawing also shows your fascination with fantasy, and your naturally given artistic talent and love of horses. Your honesty and humbleness really came through when you described the first horse encounter at the ranch. It’s true that fear of success is probably the most difficult thing of all to master and confront within oneself; whether in the horse ring, in business or even in our personal lives. With horses, it’s all about the here and now. I love how you captured the freedom and elusiveness of the horse in your design, and wish success to your business and to your friend’s farm. A real deep turbulence in my heart. I am so impressed by the story and by you – you are a great artist! And a wonder, when I see your pictures I am directly 16 years old, sitting in your house in Toronto, giggling with you and Krista, looking at your paintings from horses, mostly unicorns and I feel deep inside the same admiration, wow! So I think your feelings and your paintings are you, from the beginning……..not 100 years ago! What an inspiring story and fantastic logo! Great work! The first thought I had, when I read the story and saw the drawings, is that you have always been an artist. The drawing of the unicorn reminds me of the drawings and paintings you sent to Omi. I remember me as a child sitting on her sofa and adoring what you had drawn, looking at it over and over again and trying to draw as beautiful as you did. 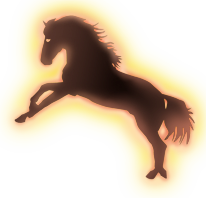 I clearly remember the horses with curly manes and -best of all- a couple flying in the air carrying a torch. I don`t know what happened to these drawings, but after all these years they are still in my mind. What a touching story! I love the logo that was the final choice. The horse is not quite captured by the Q but still retains that element of wildness/freedom by keeping part of its body outside. It must indeed have been a life changing experience considering your long involvement with horses. Thank you for sharing! Fantastic site! Thank you for showing us a powerful insight into what Dianne Benson is all about. Yep she’s my sister and I love her and think she’s the best thing ever! However, as I sit here in Ripon, North Yorkshire, England reading this site, I can clearly see that the message of a relative stranger/new work colleague has captured the essence of what my very talented sister can do. I’m so pleased for you as your artwork is as amazing as your experience! Sonya, what a beautiful description of your experience with those horses and client. I love your descriptions, especially of how you felt when you were rejected by the horse, and the insight afterwords. Your logo solution is perfect – you’ve captured the essence of the company – the energy and mystery. I love the luminosity inside the “Q”. Beautiful work!! 1. I applaud you for finding the way that works: turning yourself inside out! 2. You, my dear, ARE that logo…a wild and free horse, forever leaping forward in your quest to find and define the beauty, strength and ‘uniqueness’ that you possess, and then, so creatively present it to the world. I love the posting, the story and YOU! And this from a non-horse person — OY! You’re a whinny…oops, I mean a winner!